Ok, I just realized I’ve worn pink in EVERY post this week and I’m wearing this hat again!!! I guess I’m back on pink kick after all the neutrals from fall and reds from Christmas! So I’m not even going to show you the shoes I’m wearing in this post because it just looks absolutely ridiculous. I was running late and heading out the door and I thought my black uggs were buried somewhere in the mess of my car so I threw on tennis shoes that were sitting in my mudroom to drive in. I pulled up to where I was going and searched my car, but no uggs. I thought about maybe not photographing this outfit since I clearly was wearing the wrong shoes for the weather but I was not about to let a cute outfit and the fact that I actually was ready to do a shoot ruin it all. So…here’s my outfit with the wrong shoes that I’m not going to show you because it just looks ridiculous. I hope you all have a wonderful weekend and thanks for stopping by!! I’m sure that even with the most ugly shoes you look pretty, as always ;) This outfit is just too cute. Hi Rachel, I am a new follower and love your blog. I saw your earlier post that you’re building a new home. I am totally in love with your current home especially with your front door. Would you please kindly share who made the custom door? I can’t find any information on your blog with regards to your beautiful fron door. I really appreciate your help. Good luck with building your new home and keep up this amazing job on your blog for 2017. Happy New Year! Can you post a link to your burgundy boots from NYE?!? Aw, Rach, we all have those moments; I’ve worn the wrong shoes on rainy days, etc. Anyway, I love the rest of the look ;) That coat is gorgeous and looks so good with the all black and grey bag. Thanks for sharing and I hope you have a wonderful weekend! Too funny about the shoes! I am obsessed with this beanie. I got one like it for Christmas and it’s my new favorite. Also, I just wanted to let yo uknow that your blog posts haven’t been showing up in my bloglovin’ feed since the beginning of December. I’m not sure if there’s something wrong with your RSS feed or if it’s on my end? I just emaield bloglovin’ to find out but wanted to let you know! Isn’t this beanie the greatest?! And oh no! Let me look into Bloglovin’ and see if we can figure out what’s going on. Thanks for letting me know!!! Actually, now that’s its been mentioned it hasn’t been showing up on my bloglovin feed either. That’s happens to me too when you think you’ve got something you need in the car and then get to your destination only to realize its not there. I wish you did show the shoes bc I would have loved to see the tennis shoes with this outfit!!!! Haha such a funny storry! There are so many times I go to shoot a look for my blog but forget something at home. If I truly love the outfit and it isn’t necessary I’ll just shoot anyway. Have a great weekend! Have you done a tutorial on how you do your eyebrows? I would love to watch and learn! I wear clogs. . ALL THE TIME! I have a pair in every color. I was running out of the house with one brown and one black on. Didn’t realize it till the end of day. Oh my goodness!! This totally sounds like something I would do! Love it! I’m loving that pink coat! Such a pretty color! Love that bright pink! You look fab! I’m sorry you couldn’t find the shoes you wanted to wear with this outfit, but I love your positive outlook. This outfit is very cute, especially that pink coat! Looking super sweet in this bundled up outfit! Love your coat! Another color you look fantastic in! Is there any color you can’t pull off? LOL Beautiful!! You rock the pink like nobodies business! Obsessed with this coat! I didn’t even notice that I couldn’t see your shoes….I was thinking how beautiful all your pictures have been lately with the snow in the background. The contrast with your black coat and now this pink one make for some really beautiful photos. Same with Isla’s recent photo. Good job! I love the pink hat to compliment the jacket! Nothing better than some winter brights!! I love the pink and gray combo! You look so cute! The more pink the merrier!! Love how you added in distressed black jeans for a little contrast! I’m loving this pink coat and hat combo! It looks stunning on you!! Thanks Alexis!! You are so sweet!! Lol! Too funny – I wouldn’t have even noticed you didn’t have shoes in the shoot if you didn’t mention it. Love the look. Pink against the white snow – so beautiful! Love this shade of pink! ♥ A. 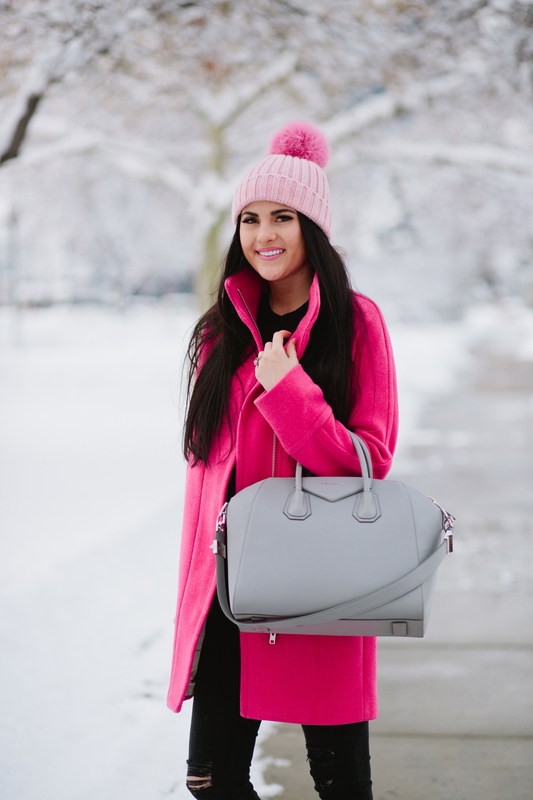 Girl, I absolutely love the pop of pink in this outfit it stands out so beautifully against the snow! LOVE this coat and hat! Perfect for the snow. Love this look! You always get it right! Thanks Emily! Clearly, I’m really obsessed with this beanie (it’s almost embarrassing haha). What a beautiful look! i love the pink coat! absolutely loving all the pink, you look gorgeous! Gorgeous pink on this jacket! I love how rich the color is, it really pops against the white snow in the background. I love hearing the ‘behind-the-scenes’ story about the shoes as well :). Another beautiful post! I love that coat, but I couldn’t find it on either site. Is it from a previous season? Thanks, and keep the pink coming! That’s so exciting! Just having moving to a new house it’s alot of work but soo worth it. Thanks! We are so so excited! Lovely outfit! I also love wearing pink and the bag is very nice! Is it really the Angel lipstick by MAC? It Looks a bit darker to me. Love the lipstick colour you are wearing on this Photo.